On Sunday I had the good fortune to photograph surfers on Newquay’s ‘The Cribbar’, the UK’s largest inshore wave (legend speaks of an even bigger and rarer one, the Zorba reef, a mile or so offshore). This wave only occurs under precise conditions of a huge swell, a very long swell period, a particular swell direction, and a southeast wind, meaning that it only appears 2 or 3 times a year. Even rarer is for surfers of the calibre required to ride it to be present and willing. I’ve wanted to see and photograph it ever since moving to Cornwall 3 years ago so it was great to get the chance. 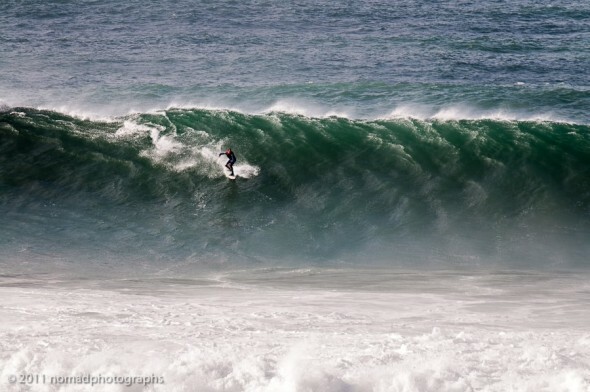 A huge crowd was present and cheering the surfers on Towan Head, where I took these photos. It is very difficult to catch a wave this big by paddling into it as surfers find it hard to match the speed of the wave using their arms alone, and on this occasion the surfers were towing into it with jet skis, which would collect them after their rides (it is a very dangerous spot). The first surfer, in the blue wetsuit, is Ben Skinner (‘Skindog’), one of Newquay’s most famous locals and a former English champion. I am not sure who the surfer is in the last two photos. *update* – Tom Brown, of the Isle of Thanet Gazette, has told me that the surfer in the last two shots is Dan Chapman. This entry was posted on Wednesday, November 2nd, 2011 at 5:33 pm. It is filed under General. You can follow any responses to this entry through the RSS 2.0 feed.